Is there a more tragic story than that of Zabuza and Haku from Naruto? And after that trauma you only find purpose in becoming someone’s tool? But anyway… This is a really impressive cosplay of Momochi Zabuza and Haku! 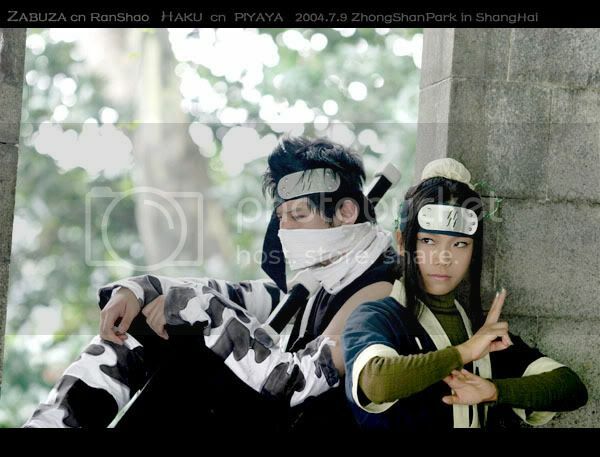 From the image, it says that the cosplayer’s real names are Ran Shao (Zabuza) and Piyaya (Haku). And this image was apparently taken in Zhong Shan Park in Shanghai back in July 9, 2004. I’ve recently shown a nice cosplay of Inoue in her Shinigami disguise… Now how about a school uniform version? I forgot to mention before that Inoue is actually an orphan in the Bleach series. She apparently ran away from her abusive home along with her older brother, Sora. Orihime was bullied when she was a child because of her hair, so Sora decided to give her hairpins. Orihime refused to wear them, thinking they were childish. Unfortunately, on that same day, Sora was killed by a car accident, and Orihime wore the hairpins ever since. Anyway… Isn’t she cute? Fair white skin! You are currently browsing the Nanao’s Cosplay Research weblog archives for November, 2007.